Minot AFB, North Dakota, about 80 miles south of the Canadian border, was opened in January 1957. The first military unit established there was the 32nd Fighter Group, activated as a Strategic Air Command (SAC) in February 1957. 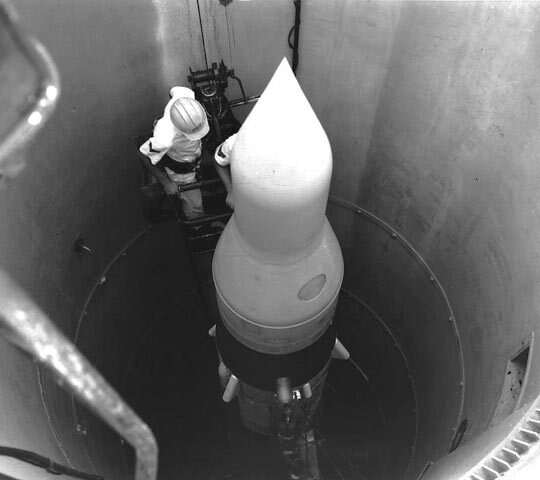 By mid-1964, Minot AFB had 150 Minuteman I nuclear missiles in underground silos. 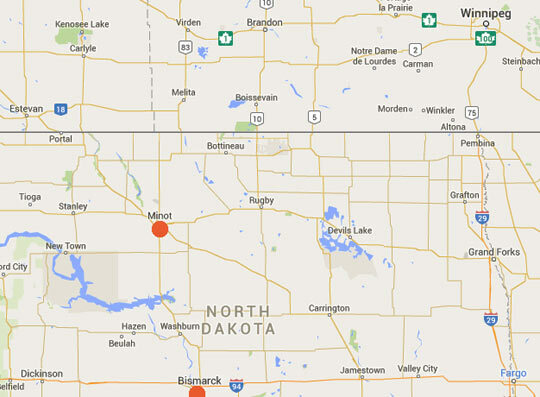 Red sites include Malmstrom AFB in Great Falls, Montana; Minot AFB in Minot, North Dakota; F. E. Warren AFB in Cheyenne, Wyoming, and Scotts Bluff, Nebraska. 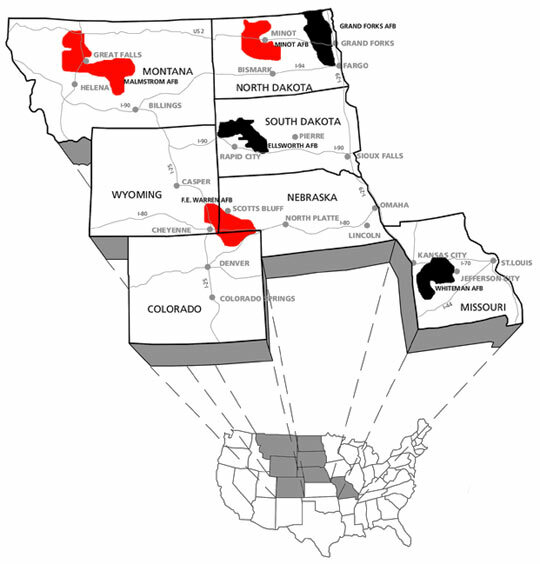 The black sites include Whiteman AFB in Knob Noster, Missouri; Ellsworth AFB in Rapid City, South Dakota; and Grand Forks AFB in Grand Forks, North Dakota. The black sites were decommissioned in the 1990s after the Strategic Arms Reduction Treaty of 1991. Image source: MinotB52ufo.com. 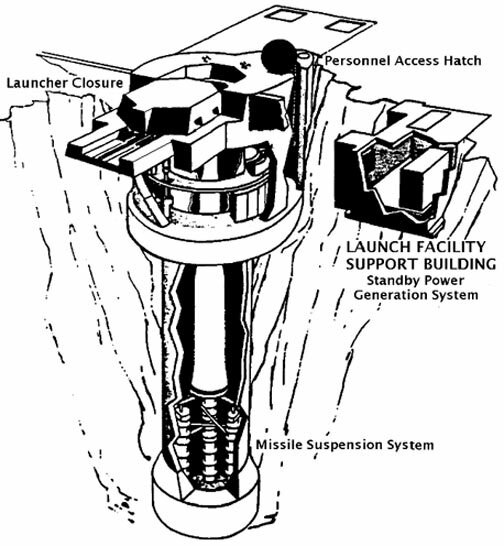 Typical unmanned Minuteman Intercontinental Ballistic Missile (ICBM) Launch Facility. 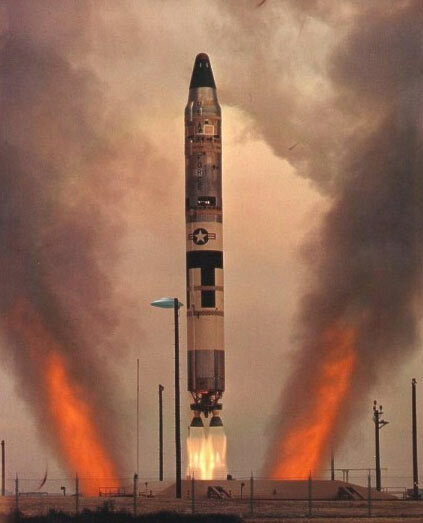 By April 1967, 1,000 Minuteman missiles were emplaced and operational at six sites in seven states. Prior to launch, the 20-ton Launcher Closer covering the missile was blown open with explosive charges. Entrance to the lower equipment rooms surrounding the missile was through the Personnel Access Hatch. The separate Launch Support Building housed electrical equipment, a standby diesel generator, and brine chiller that provided temperature and humidity-controlled air to the launcher. Image source: MinotB52ufo.com. February 28, 2016 Central Iowa - Whatever the truths are about non-human alien agendas on this planet, by the decades of the 1960s to 1970s, there was a sharp rise in UFO sightings and interactions with military and nuclear missile sites. One machinist, who asked me to call him “Dennis Smith” for anonymity, was in the 8th Air Force 450th Bomb Wing at Minot AFB from 1964-1966 in North Dakota. Dennis was born and raised in Iowa and apprenticed to be a machinist before enlisting in the U. S. Air Force in Fall 1962 to work on propeller planes. Curtis LeMay was Secretary of the Air Force then. By 1965, Dennis had become a shop chief in the machine shop for Minot's 450th Bomb Wing. Previous PostPrevious Part 3: Did FDR Commit Suicide?